The good growing season continues. Every time I start to get nervous about the desiccating heat and our lack of an irrigation system, it rains again. Happy plants bulge with fruit, the barn is brimming with onions and garlic, and the foods of Fall are already in the works. Although the heat started early and continues to bear down, there is sweet mercy in the cooling, gentle rains. Let’s hope it keeps coming! Courtney has finished her teacher-certification classes and this week is honing her skills st a foreign language camp. She has bravely pushed through the disorientation and exhaustion of the last six weeks and is now enjoying interacting with kids. Because the camp only lasts the morning, she is able to come home every day, which is mighty nice. The first day of school at Henry County High School is August 11. It is easy to see now there is a baby growing in her belly. Besides the bulge, we’ve got pictures and a vigorous little heartbeat to prove it. Trying to fathom the new reality of husbandry to come. Excited and bewildered. Full of love. Tomatoes! Purple, orange, and red cherries, peach and paste tomatoes, big red slicers and juicy, ugly heirlooms, pink, yellow, orange, green, white, and striped tomatoes, tomatillos. For many the greatest gustatory pleasure, the most epic epicurean adventure of Summer, tomatoes are in all their glory right now. They’ve thrived this season, and, despite the fact that some critter is eating holes in all the largest, most beautiful specimens, they should be in abundance for a while. Let us know if you’d like a box for canning. Sweet Onions are all harvested and curing. Red and Storage Onions are gradually being pulled from the field and into the barn. This is the best onion crop we’ve had on this farm. Ought to be plenty to last to the end of the year. Peppers are finally really producing. The intense hot weather killed off the first round of flowers, but the plants are looking good and getting heavy with fruit. Eggplant will soon enter the shares. Okra is booming. This is an okra kind of Summer. If you’re a big fan, don’t be shy taking your share; a number of people do not want theirs. If we grew only okra we would pick it every day—maybe twice a day—and no pod would ever be longer than 3 inches. We pick twice a week, and 3 or 4 days is plenty of time for a zucchini or an okra pod to go wild. First planting of Summer Squash and Cucumbers is winding down. Another is on the way. Watermelons and cantaloupes are close. Last year groundhogs wreaked havoc, this year we’ll see. Beans have suffered from the heat. Blossoms drop off and the plants wait for a cooler time. Planting 3 is not far off, and #4 is coming along behind that, so we still have plenty of opportunity. Sweet corn has not fared well either. We usually have three crops, but this year we will have one. Planting one failed to germinate, number two looks good, and planting time for number three slipped by. While the deer are fenced out, the raccoons are no doubt keeping a closer eye on it than I am. I’ll put up an electric fence inside the deer fence to protect the corn. Then, of course, there are birds, worms, winds…corn is always quite a racket. It won’t be long until we’re talking Fall crops! Thanks again for the many and various ways of help. Summer is always super intense. To go from two people full-time to one person in the height of the season has been a little insane. But your company, your helping hands, your encouraging words, your unwavering support has kept me going and from going completely nuts. May the bountiful produce, the purposeful process and the sacred provenance be nourishing to you and yours, body, mind and spirit. Thanks to all who came out and made our Summer Solstice potluck a great event. 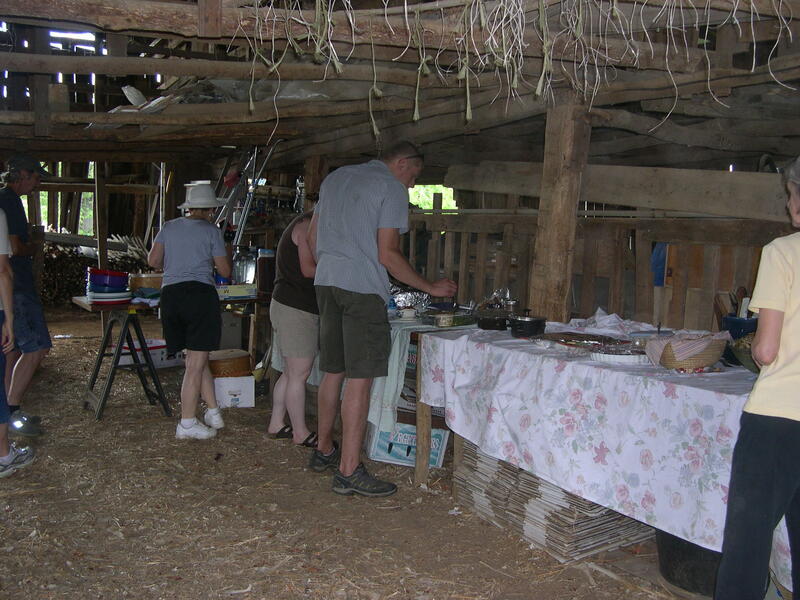 Experiencing the farm and its food firsthand is a vital component of CSA. We love to share this place and are encouraged by your appreciation and respect. May the soil-farmer-consumer circle be unbroken. This is always a busy time of year on the farm, but never more so than this year. With the normal fixins (planting, weeding, picking, etc.) plus Courtney away at school, an early heat wave, and a predator in the chicken coop, it has been hopping. 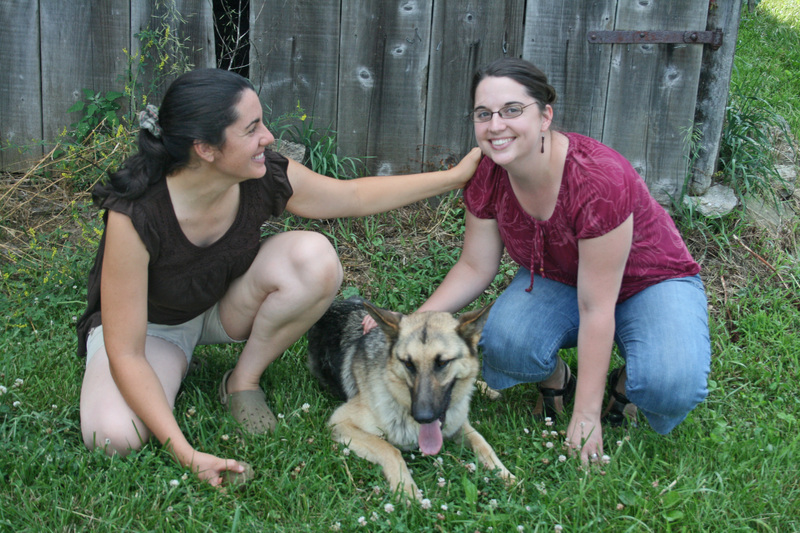 Which is why it has been crucial to have wonderful, generous, encouraging, nourishing help. Many thanks to all of you for breaking the loneliness, easing the burden, and making joy and jokes in the June swelter. Tuesday was a big day. The incessant Summer steam had receded, and the tender breeze rendered a sweet reprieve. While I gathered produce and packed the boxes, Dottie, Wayne, Katie, Maria, Gary, Stan and John pulled and sorted garlic. By lunch (a fabulous spread whipped together by my mom), over a thousand bulbs were out of the ground and curing in the barn. 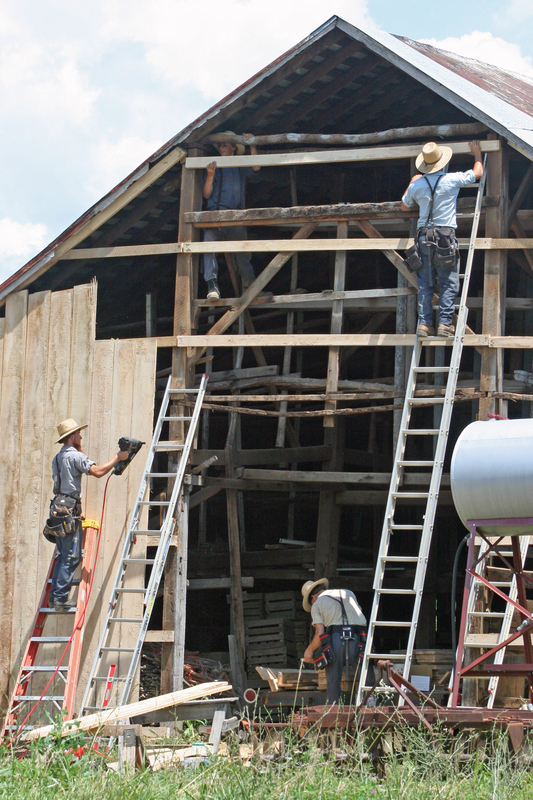 Meanwhile, an Amish crew was busy repairing our old barn. For two and a half years we watched as each storm rattled loose more of its siding, leaving wide holes for rain to blow through. We bought the lumber from our good friend Steve, the local CSA pioneer who now has a portable sawmill. He harvested the ash trees from his farm and delivered a trailer-full of beautiful lumber to our barn. It really is quite an extreme makeover. The day was altogether a testament to the impressive things that can be accomplished by a community working together. Although the term “CSA” can be co-opted and corporatized just like anything else, the esprit de corps of our cooperative organism cannot be cloned in a cloistered boardroom or bought and sold or trucked in and stored in walk-in coolers. The spirit is alive here. It is watered with sweat, fed with food and propagated by people. The spirit of CSA ever strides towards more aware and more familiar—with soil, sky, seasons, seeds, energy, origin, work, weeds. We want to know what has been sprayed on what our children eat, whose children’s parents are toiling in the fields for whom and for what quality of life, what biodiversity is being destroyed or begotten by our food choices. We want a new economy that considers all the stakeholders and values honesty and decency. We know the web is infinitely wide and we are unalterably interconnected. The farm smells like garlic at present. The bulbs have nice size this year. They take a couple weeks of drying to be fully cured and keep well, and they will no doubt appreciate our improved barn. Expect a steady supply of garlic for the rest of the year. Beets and Carrots are maturing and look good. We enjoy the variety of colors and shapes. Let us know which ones you like best. Basil and Swiss Chard are the workhorses of Summer. I’ll do what I can to give you a week off from time to time, but they have really been booming with the heat and good rains. You will also get a bit of New Zealand Spinach this Summer. It and chard are the only greens that thrive in our heat. The first Sweet Onions are about ready. The whole onion crop looks good at this point—and much better since the huge weed problem was resolved. Summer Squash and Cucumbers are abundant now. They will go down to insects before long, which is why a second planting is on its way. Cherry Tomatoes have started ripening, which means it will be no time before the world is aflood with tomatoes. The plants are very healthy and loaded with large fruits. Look out! Okra has begun. We know some of you love it and some hate it, so it will not regularly go in the boxes. If you are a lover, help yourself a la carte. Peppers are just about there and Eggplant is not far behind. John Grant says potatoes are almost ready. Hope you are enjoying the season so far. Thanks for being a part of A Place on Earth. 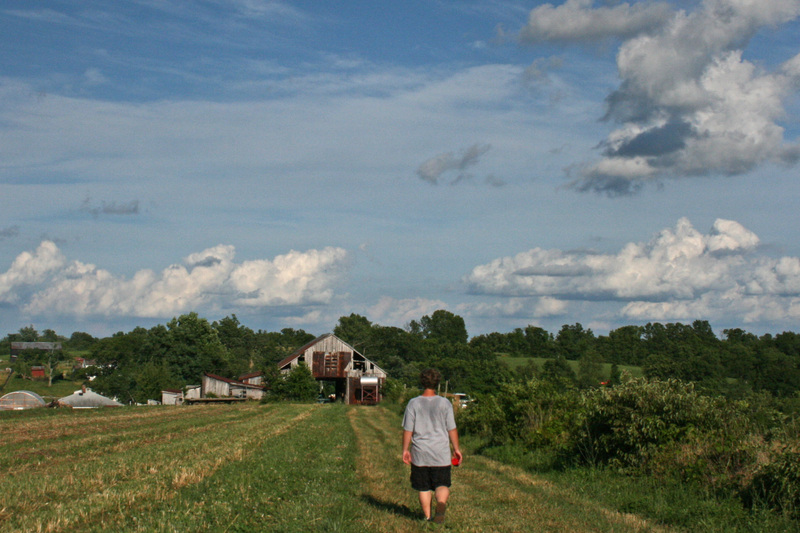 You are currently browsing the A Place on Earth Csa Blog blog archives for July, 2010.